Fits generators up to 25" x 23.6" x 20.3". You want your Champion Generator to be clean and ready when you need it the most. With this Champion Num. C90016 generator cover you can protect your Champion Power Equipment generator from UV rays, weather, dirt and dust while your portable generator is in the garage, storage shed or with a cover on the road. Cover is made from durable, water resistant vinyl and is specifically designed with elastic base for a custom fit. Dimensions are: 30.7" (L) x 23.6" (W) x 23.6" (H). Lightweight for easy coverage and movement. The inside of the cover is lined with cotton to protect your generator and prevent scuff marks and scratches. Quality is such that it should protect your generator and its engine for years to come. Cover is not designed to fit over wheels. by GenTent for use while running. Run on natural gas, low pressure propane or gasoline. According to statistics, more than a hundred people are killed by floods every year. Also, more than four billion dollars are the cost damages caused by floods. All this is according to the Red Cross of the United States. Know what are your community’s plan for evacuation. This helps you prepare yourself as well as your family and friends as to what to do as well as the step by step drill. These documents include any policies for insurance, passports, birth certificates, etc. All these papers should – as much as possible – be kept in a box that is waterproof and one which could be accessed easily. If in case your fireplace, furnace, electricity panel or water heater is in the basement or 1st floor of your house, you could consider moving it up to the attic. If you use sump pumps in your basement or any other area keep a portable generator available to keep these pumps working if the utility power goes off. Battery operated pumps will keep your pumps going for a while, but a generator can keep them working for days. Be sure to store your generator where it won't get wet also. As much as possible, keep a radio that is operated by batteries to use in case the power goes off. All in all, lots of preparation is always the best defense against floods. Keeping your Champion generator free of dust, dirt and dry while in storage is so important to help your generator to be in good running condition when you need it. These size generators are usually purchased because they are easy to roll around when you have a power outage, for power tools on your construction site, for medical equipment, sump pumps and more. 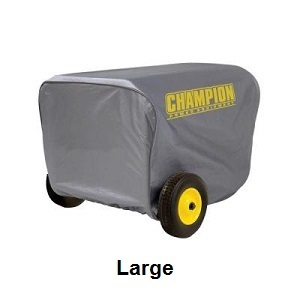 This Champion generator weather cover is lined with cotton to prevent any scratches or scuffs on your portable generator.